Too pooped to pontificate, so lemme bottom-line things: Civil War is good, and I enjoyed it very much. Lauren loved the flick, and it gave Dawn a headache. If you liked other installments from this universe—or like Marvel Comics in general—the trend will continue. Pros: it's funny, includes a closet-full of snarky characters, and is long. I love long movies. Cons: Civil War is truth in advertising. There's a lot of fighting here which, for me, grows wearisome (just as it did in 2013's Man of Steel, which was borderline Transformers). Less is more. Addition by subtraction. 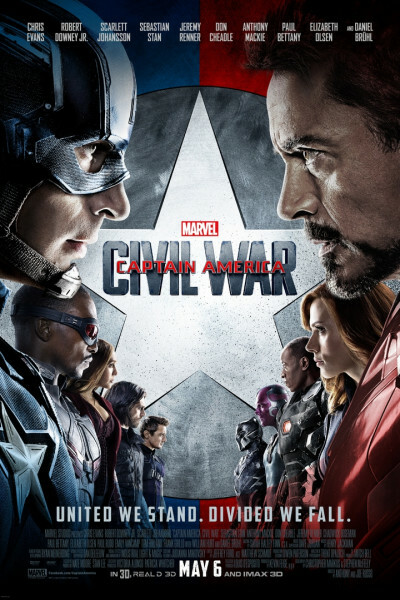 I'm pretty sure I've seen Civil War before, or an installment very much like it, about five times now. So, it's pleasurable but growing old. Anyhoo, it's fun seeing this large cast together, and I had a ball, yes. Next, I'm looking forward to Money Monster, starring George Clooney and Julia Roberts. I feel like we are growing old together.